It was 1999 and I was fresh out of college. My father had raised me on stories of Wall Street and investing. Landing a gig at a major brokerage firm was a dream come true. And it was one of the best times. The market was on fire. Stocks were soaring higher. Tech was a hit. Dot-com anything was an instant hit. People were hiring and paying huge salaries. Money was flowing freely. And Federal Reserve Chairman Alan Greenspan couldn’t raise rates fast enough to cool the market off. And then, just as I was switching to a private investment firm — around the fall of 2000 — the market started to fall apart. The S&P 500 Index suffered a 48% drop before the bleeding finally stopped. Dot-com millionaires were suddenly wiped out. Companies that had so much potential disappeared completely. The Department of Labor graced the market with some great jobs data on Friday. The unemployment rate hit a 48-year low at 3.7%, down from 3.9%. In September, we added 134,000 jobs, which was slightly below the Street estimate for 168,000 new jobs created. However, many are blaming the impact of Hurricane Florence on the slightly slower growth. That’s fine. For the first nine months of 2018, the U.S. has added an average of 208,000 jobs per month, up from an average of 182,000 jobs added each month during the same time period a year ago. Wage growth slowed in September, increasing 0.3% to $27.24 per hour for the average worker. Over the last 12 months, the increase in pay has slowed to 2.8% from 2.9% in August. But we’re poised to hit 3% wage growth and more soon … and that could spell some serious trouble for the market as we look ahead to 2019. The American labor market is stretched thin. The recent low rate of 3.7% beats out the low we saw in April 2000 of 3.8%. And that’s got me worried. I’m starting to see a number of parallels to 2000 and that dot-com crash we suffered through. In 1999, I’d just started working with a major brokerage firm. I remember those heady days of fast-moving initial public offerings and stocks jumping double-digit percentages in a matter of hours. New millionaires were being constantly minted. People were giving up their jobs to be day traders. At the same time, companies were growing and hiring as fast as possible. Markets were tight. New, skilled employees were hard to find. 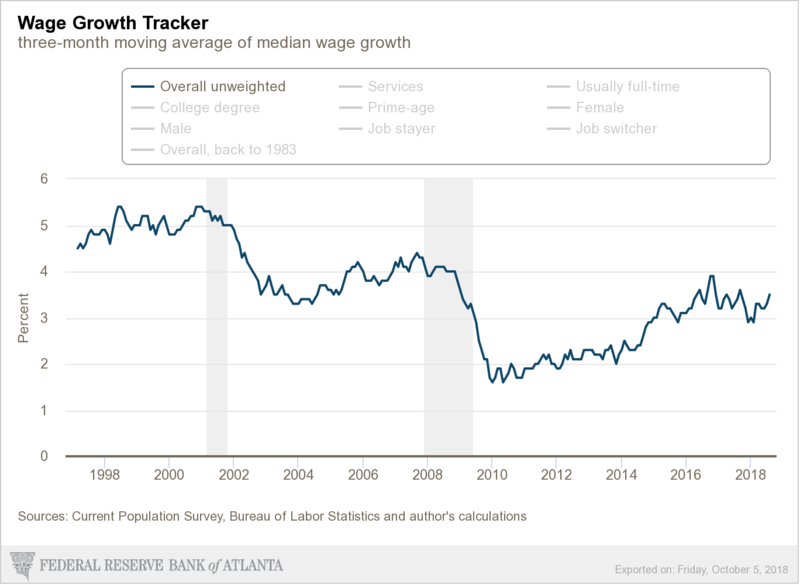 By the end of 2000, the median wage was growing at a rate of more than 5% using a three-month moving average. Today, we’re at around 3.3% and rising. And there’s one more critical piece I want to toss in: the Federal Reserve. Recently, the Fed boosted interest rates by 25 basis points so that we’re balanced between 2% and 2.25%. Chairman Jerome Powell is talking about another rate hike at the final Federal Open Market Committee meeting this December, which would put rates at 2.25% to 2.5%. I’ll give you that we’re a far way off from the 6.54% peak we reached in July 2000 before the Fed had to start shaving points off to save the market. But I think it’s important to remember that before the crash in 2000, interest rates had to climb from a low of only 4.6% in January 1999. We spent roughly six years at near-zero interest rates, and it has taken us another three years to climb to just 2%. There’s an entire generation of spenders who have no clue what a 6% fed funds rate feels like on their budget. But I don’t think we’ll get up to 6% before everything falls apart. I’m not sure we’ll even see 4% before the Fed has to backtrack. The labor market is tight, and businesses are still growing. They have to keep hiring to keep up with demand. As a result, they will raise wages to lure in more workers. Higher wages will lead to inflation. The two just come hand in hand. So far, inflation has been muted because wage growth has largely been muted. But wages are rising, so inflation is coming too. The Fed’s job is to keep inflation under wraps, so it will keep lifting interest rates. As interest rates rise, they will put a stranglehold on business growth. The economy will stumble, and stocks will fall. And in 2019, we won’t have snazzy new tax cuts to keep businesses afloat. In 2000, we enjoyed a hot market with a tight labor pool, growing wages and rising interest rates. Just like right now. The difference between the two is that in 2000, we weren’t rising from near-zero interest rates. That means rates won’t have to climb nearly as high for the market to be derailed. We could see the market starting to fall apart as soon as 2019. We still have ample time to enjoy some nice market gains. But keeping your portfolio diversified against the coming market downturn will protect you from suffering significant losses.